This kit contains everything you need to grow cherry tomatoes in a window garden. Turn your window sill into a produce counter with this cherry tomato grow kit, which comes with everything you need to enjoy the sweet fruits of your minimal labor. The secret to making it so easy is the olla (pronounced oy-yah), a 4,000-year-old piece of agricultural technology. It's a small, unglazed ceramic jar that you fill with water, but the olla automatically releases the right amount of moisture as the soil dries. 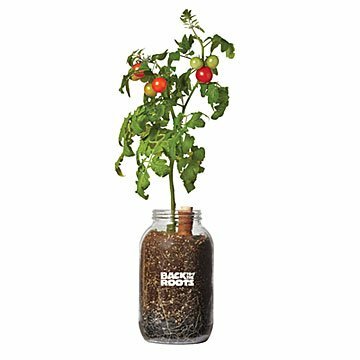 The kit also comes with all the supplies you need—cherry tomato seeds (which germinate in just 1-2 weeks), jar, organic soil, and organic fertilizer spikes—so that even gardening novices will be able to follow the simple instructions. Made in Utah. Refill olla when empty and soil appears dry (approximately once a week). Push one organic fertilizer spike into soil when flowers appear and the second spike after first tomatoes appear. Left the planter in a sunny windowsill, consistently filled up the olla, yet nothing. Very sad about the results. Because of the merchant's willingness to comp us a new planter, we were able to get it working this time. I wish I could delete or change my previous review, because I definitely recommend this planter and give them 5 stars! Excellent customer service, and I'd buy from them again. The instructions were a bit different though this time, and they were easier to follow and understand. It could be that we just don't have a green thumb, but my wife and I were never able to grow any tomatoes, and it's been 3 weeks. There's no sprouts, nothing. We made sure to have water in the inside part, and we kept it in the sun. We even moved it outside into the sun after 2 weeks.....but my wife loves the jewelry from Uncommon Goods, so I'll definitely be buying that again! I kill everthing - but this is blossoming! My daughter has been asking for a garden for years but I have a complete inabilty to keep plants alive. I bought her this tomato planter for Christmas with reservations. Despite starting it in winter with 64 degree indoor temps, this has flourished! We are amazed at the ease of care and the amount of growth. I don't usually write reviews but this was a huge success. This photo is 2 months since we started. Easy to follow instructions. Sprouts came up within a week. Not sure if we did something wrong but it took more than 7-14 days to sprout. It's sprouting now and it's very cool! Very neat that it is self-watering. They loved the gifts. Look forward to the growth.